This post is sponsored by One Degree Organics. Chocolate. Peanut Butter. Dates. Sprouted brown rice cocoa crisps. Sprouted rolled oats. Cacao nibs. Flax. Chia. Cardamom. Cinnamon. I love it when a plan comes together! Whenever I make granola bars I’ve gotta say, my main goal is to pack it in. Spices, sprouted grains, sweetness, superfoods, chewiness and crunch. I’ll slather it all in chocolate if I can. Because I like a granola bar that tows the line between snack and dessert. I always go way over the edge into hippie dip land with the health-factor (not gonna lie). But in my book you never have to skimp out on decadence just because flax seeds are involved. These bars are full-on addictive. We nosh them so fast that I can barely keep them around for 24 hours when I make a batch — so I tend to make double or even triple batches. Logan and I can’t get enough of that whole sweet-chewy-crunchy-chocolatey combo, especially with the addition of cardamom/cinnamon/vanilla/flakey sea salt. They’re a riff on this recipe, which is perfect as-is. My version is just a bit extra, if you know what I mean. For the rice crisps I used One Degree Organics Sprouted Brown Rice Cacao Crisps. I’m stoked to work with this brand because they’re already one of the only cereal brands I pick up in the grocery store. No weird ingredients, all of their cereals are sprouted and they’re sweetened naturally with a touch of cane sugar or coconut sugar. 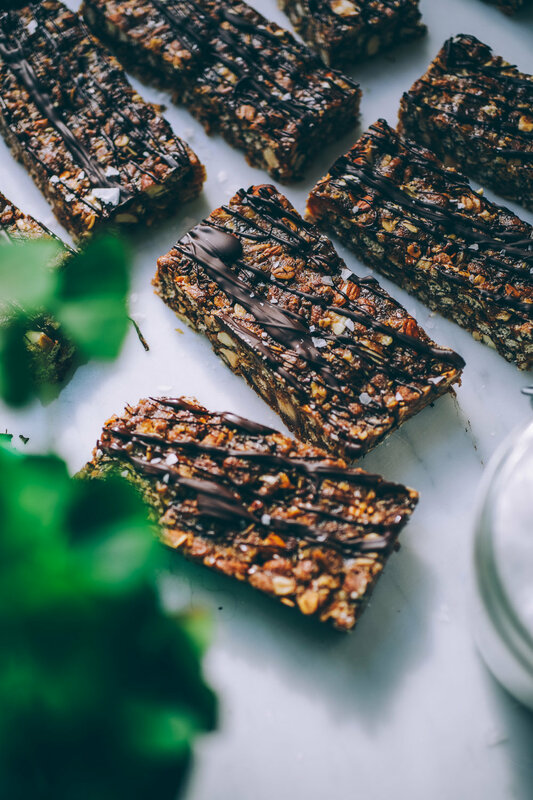 The sprouted cacao crisps are coconut-sugar-sweetened, so they're low-glycemic and also quite a bit easier to digest if you're sensitive to grains. I used their sprouted rolled oats as well. Here’s a little more info on why sprouted is better from Harvard Health. And head over to my instagram to win a gift box of One Degree Organics Sprouted Gluten Free Rolled Oats! Giveaway closes 5/11 at 12pm Midnight EST, open to USA and Canada. Place the pitted dates in a medium bowl and cover with hot water. Set aside to soak while toasting the oats and almonds. Preheat the oven to 350F. Spread the sprouted rolled oats out on a half-sheet baking pan, shaking them out to a single layer. Spread the almonds out on a half-sheet baking pan, shaking them out to a single layer. Toast the oats and almonds together in the oven on the center rack. Toast the almonds for 5-6 minutes then remove from the oven to cool. Toast the oats for about 10 minutes, until golden, then remove from the oven to cool. Once the almonds are cool, chop them roughly. 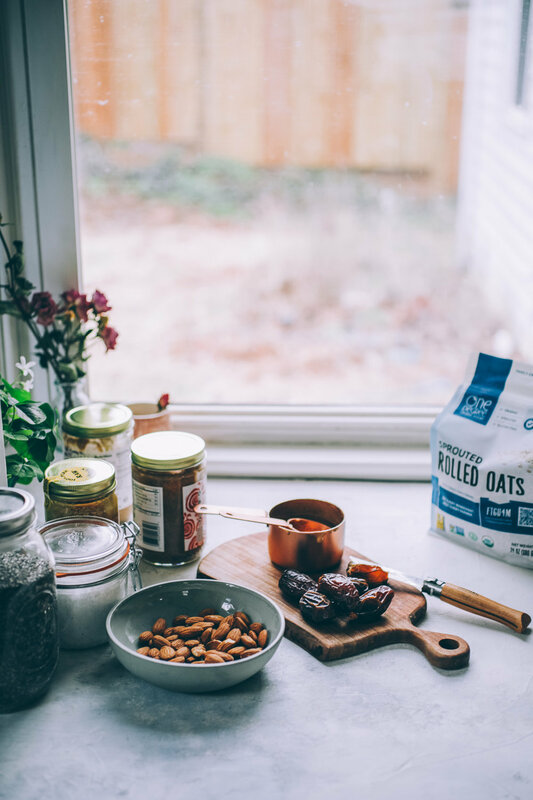 In a large mixing bowl, mix together all of the dry ingredients: toasted oats, chopped toasted almonds, sprouted brown rice cacao crisp cereal, seeds (I used a mix of chia and flax), cacao nibs, cardamom, cinnamon, vanilla bean powder and tiny pinch sea salt. Drain the dates & mash them with a fork. Stir the rest of the wet ingredients into the mashed dates: peanut butter, cashew butter and raw honey. Line a 9” standard square brownie pan with parchment paper — or if you don’t have parchment paper you can grease the pan lightly with coconut oil and lightly tap oat flour all over the bottom and sides of the pan, discarding excess flour. 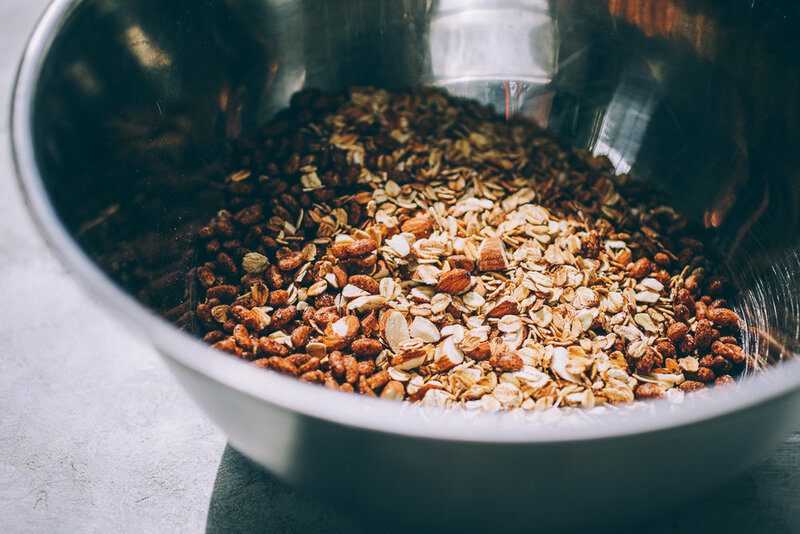 Use a rubber spatula to spread the granola “dough” out in the pan, pressing it firmly into the pan so that everything is an even thickness. Freeze your granola bars for 30 mins - 1 hour. 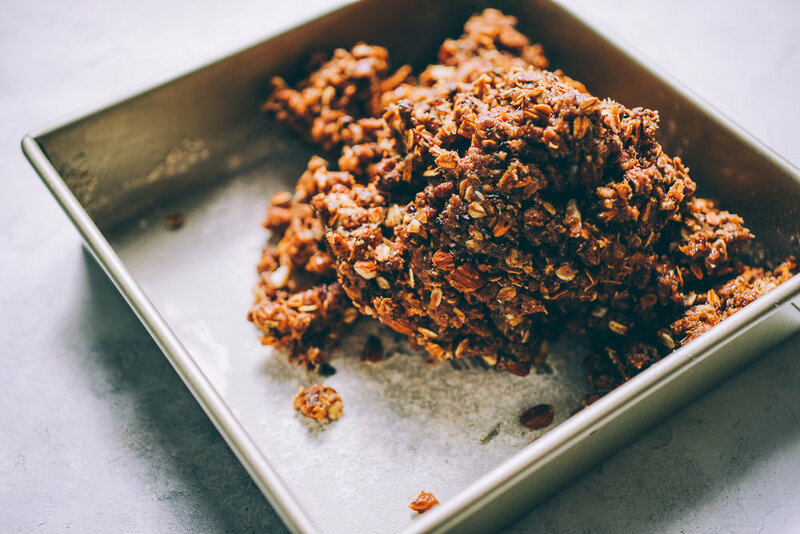 Once firm, lift the granola bars out of the pan and place on a baking sheet — or if you didn’t use parchment paper, loosen edges of the bars with a sharp knife, tap the bottom of the pan against the counter, then invert the pan over a baking sheet, banging the bars out of pan as needed to get them out. Slice into bar or square shapes as you like. For the chocolate drizzle: melt the chocolate in a double boiler. Then drizzle or spread over top. Chill in the fridge until ready to eat. Enjoy! Storage tips: I keep these stored in the fridge with parchment paper between the layers to keep them from sticking together. They last around a week in the fridge, and should keep for a month or more in the freezer if well-sealed. Recipe notes: Recipe adapted from Sprouted Kitchen. This post was created in partnership with One Degree Organics. All opinions are my own. Thank you for supporting the brands that support this site!